EXCLUSIVE CNN-FACEBOOK SOCIAL WATCH: Social media is reflecting rare reverence today - the top three trending terms on Facebook are "President Obama," "country” and “America”... but Hollywood heat still trumps pomp and circumstance. The top moment in terms of volume of traffic on Facebook today was not around Obama’s inaugural address, it was rather around Beyonce’s singing of the national anthem. What Chief Justice of the United States delivered the most presidential oaths of office and how many times did he do it? Seeing the world through the eyes of a child is the ultimate Gut Check. Sure, this is President Barack Obama’s day, but instead of looking at it through the prism of polls and politics, take a minute to look at this picture of Josiah Boprey from Phoenix, Arizona. When Josiah’s mother, Elisa Boprey, turned to the television during the president’s official swearing in on Sunday, she saw her young son raise his right hand and repeat the words Obama was reciting. “He looks like me, mom,” said Josiah after the short swearing-in wrapped up. Josiah is multi-racial; his father is black and his mother is Hispanic. 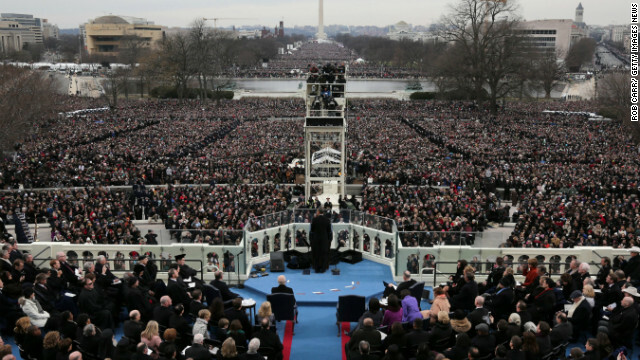 The 2013 Inauguration ceremonies to honor the start of President Barack Obama's second term in office include two official Inaugural Balls, a National Day of Service and two swearing-in ceremonies. Thousands flocked to Washington to help Obama kick off his second round in the White House, including notable names like James Taylor, Stevie Wonder, Katy Perry and Beyonce. BOOM. Boom. Boom. Women. Gay Rights. Immigration. Again, the second term president more direct than the candidate. POTUS limo's "Taxation Without Representation" license plate: Bill Clinton added in final 2 weeks of tenure, then disappeared under GW Bush. All presidential vehicles bear the same license plate number so would-be attackers can't identify the president's limo by it. Excited about this inauguration. If Obama sees his shadow there will be 6 more years of crippling crippling debt. Karl Rove in his basement, enacting a Romney inauguration with life-sized cardboard figures. Chief Justice John Marshall, the longest serving chief in the history of the United States Supreme Court, swore in a total of nine presidential terms from 1801 to 1833. Marshall swore in Thomas Jefferson twice (in 1801 and 1805), James Madison twice (in 1809 and 1813), James Monroe twice (in 1817 and 1821), John Quincy Adams once (in 1825) and Andrew Jackson twice (in 1829 and 1833). Widely considered the most influential chief justice in history, Marshall’s legacy on the process of swearing in can still be felt today – he was the first justice to wear the black robe during the proceedings. Before Marshall, the justices wore red robes with fur trim and white wigs in all public settings. His practice of a simple black silk robe without wig, which he donned when swearing in the president, remains the American judicial standard. Other chief justices with a number of presidential swearing-ins under their belt: Roger Taney with seven, Melville Fuller with six, William Rehnquist with five and Earl Warren with four. Seven presidents were not sworn in by the chief justice, although it is considered customary for the head jurist to do so. The presidents were: George Washington, John Tyler, Millard Fillmore, Chester Alan Arthur, Theodore Roosevelt, Calvin Coolidge, and Lyndon Baines Johnson. Most of these situations were in the time period following a presidential death or assassination, like when Johnson was sworn in by Judge Sarah T. Hughes after the assassination of President John F. Kennedy. Congrats to jacques stambouli ‏@stambouli and Peter Ubertaccio ‏@ProfessorU for correctly answering today’s Gut Check Trivia question.